Despite a consolidated vendor landscape of the global healthcare information systems market, top players, namely Cerner Corporation, All Scripts, and McKesson held a moderate 26% of the market in 2015, says Transparency Market Research (TMR) in a new report. The diversified portfolio of these players is the key factor helping them maintain their dominant position. Mergers and acquisitions for expanding their geographical presence and for revenue gains indirectly is also the focus of several companies in this market, notes the report. As per the research report, the healthcare information systems market is anticipated to be worth US$448 bn by 2024 increasing from US$192 bn in 2015 at a CAGR of 10.1% between 2016 and 2024. The global healthcare information systems market is studied on the basis of component, application, end-user, deployment, and geography. By component, software is expected to continue to account for the leading share in the market. The increasing popularity of mobile applications for communication between patients and physicians is boosting the growth of software segment of the market. However, the hardware component segment is estimated to register a notable CAGR between 2016 and 2024. In terms of end user, hospitals, diagnostics centers, and academic and research institutions are the segments of the healthcare information systems market. The segment of hospitals is expected to continue its lead until 2024 rising at a CAGR of 11.1% between 2016 and 2024. The need to store vast amounts of data and make them accessible to patients account for hospitals to display tremendous demand for healthcare information systems. North America will continue to command accounting for 36.6% of the revenue of the healthcare information systems market by the end of the forecast period in 2024. The growing geriatric population combined with increasing incidence of chronic diseases are the key factors behind the growth of this regional market. Moreover, governments in the region are focused on healthcare reforms and allocating substantial budgets for implementing them. North America is closely followed by Europe with Western Europe contributing the major revenue in the region. 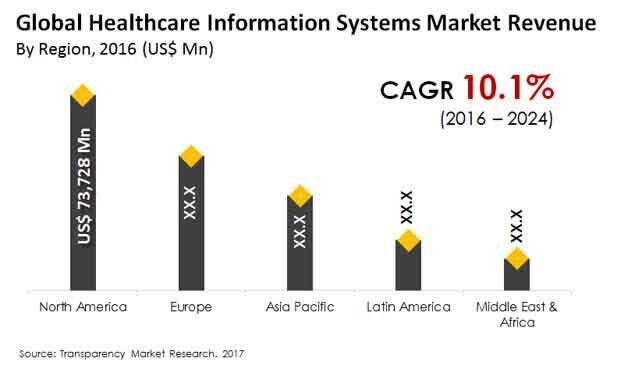 The soaring demand for improved healthcare and the need to integrate healthcare systems are driving the healthcare information systems market in this region. The rising awareness regarding the accuracy and reliability of technology-driven healthcare services is providing momentum to this regional market. On the other hand, Asia Pacific is expected to register the leading CAGR over other regions during the review period. The rising geriatric population base susceptible to chronic diseases is leading to the increased adoption of modern healthcare systems for easy access to patient information. Improving healthcare infrastructure combined with increasing investments by healthcare IT companies is further bolstering the growth of this regional market. Several governments across the world are taking initiatives to digitize healthcare systems leading to the adoption of healthcare information systems. This is because patient records in digital format is easy to transfer for improved healthcare. High cost involved in the purchase and installation of healthcare information systems and cost of training technicians to use these systems is discouraging several end users from adoption them.